myChess.eu allows you to play chess online with another person for free. An iPhone version of the application is also available. In order to play, please log in. If you don't have any account yet, please register ! iPhone version of myChess on iTunes AppStore! Enjoy playing chess with your friends online! Play on myChess.eu whenever and wherever you are! The access is totally free, and works on most computer and phone browsers. No Java, no Flash needed! A free iPhone version is available! 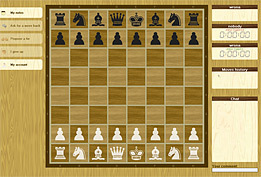 Compared to standard chess games on the Internet, myChess.eu brings you many options. You can manage current game options next to the chess board, and you can manage general options in your account. Trace your game moves ! 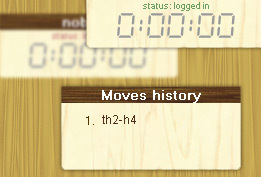 You can analyze all your finished games, step by step, tracing the moves directly on the board. During a game, you can also write some notes and edit them whenever you want. 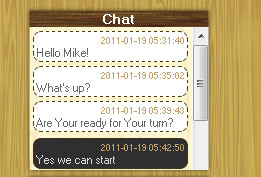 Chat with the other player during the game! A chat functionality has been implemented next to the game board. This allows you to easily communicate with the other player. 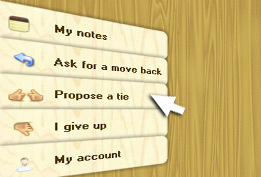 It also traces all options chosen during the game.